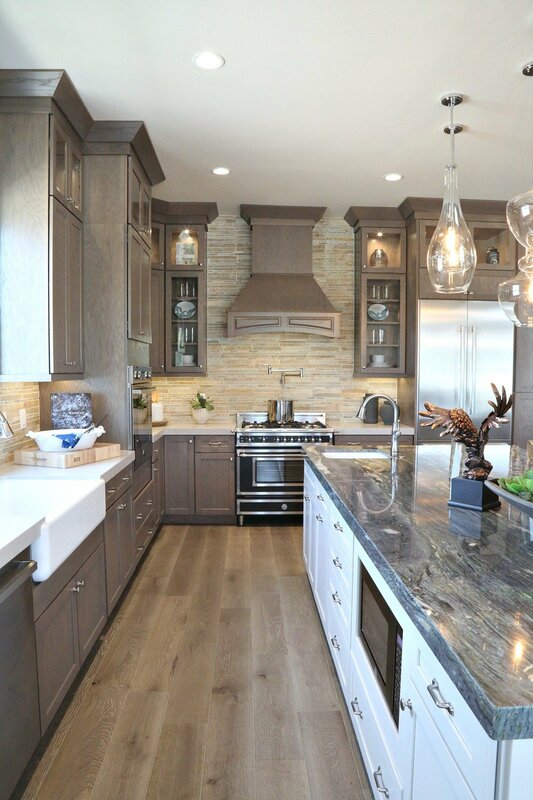 One of the most popular questions I have received over the years is what are the best products and staining tips for changing the stain color of my cabinets? I have learned that there are many of you that have no interest in painting your cabinets with paint and prefer a stain finish. However, I also know that several of you are interested in changing the stain color (maybe going darker/tone down the warmth/gray or almost black stain). Today I wanted to finally tackle this subject and share our best tips for staining cabinets or re-staining to change the color. 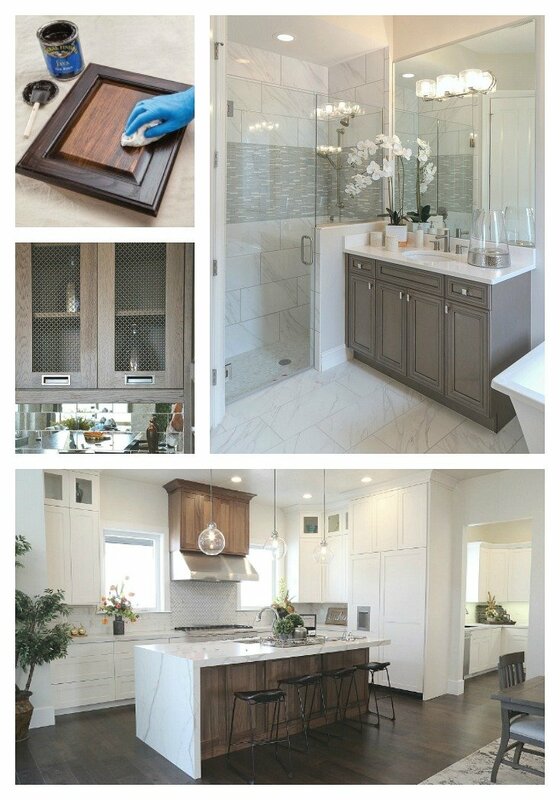 Whether you’re interested in staining your kitchen cabinets, bathroom vanity or media cabinets in your home, the great news is that it’s pretty easy to do and with the right products and stain, I have been so blown away with the professional results that we have seen on our client projects and in my own home. 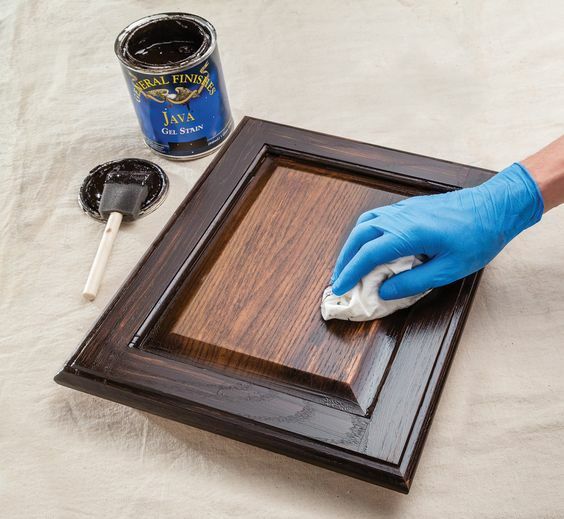 Over the years, I have pretty much tried every stain product on the market and nothing compares to General Finishes Java Gel Stain (oil-based). This is not a sponsored post in any way and I can pretty much tell you that from our experience and talking with other paint/DIY bloggers, General Finishes Java Stain is one of the top stain products on the market. It’s so easy to work with, goes on smooth and the finish looks so professional. I also love their color selections as well. The good news is that today, there are so many great colors to choose from when it comes to re-staining cabinets versus even five years ago. 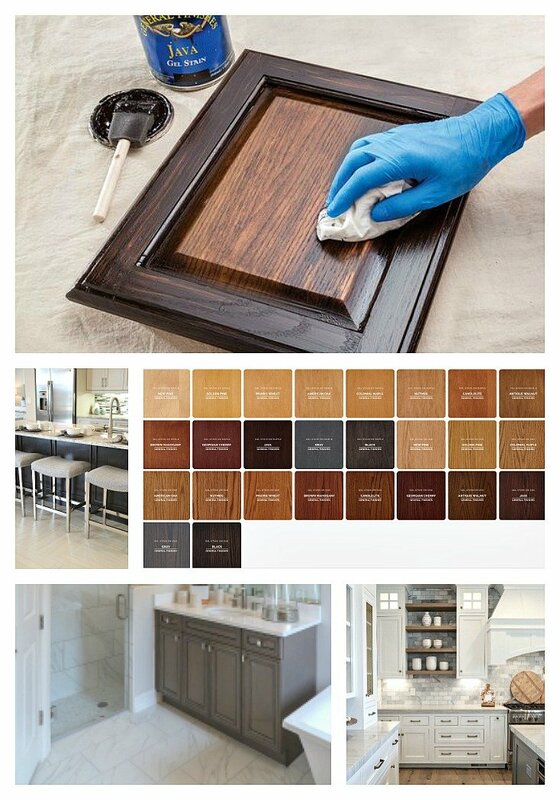 Another reason I love General Finishes stains is they have a fantastic color selection of stains that are updated and shades that I am seeing in new homes today. 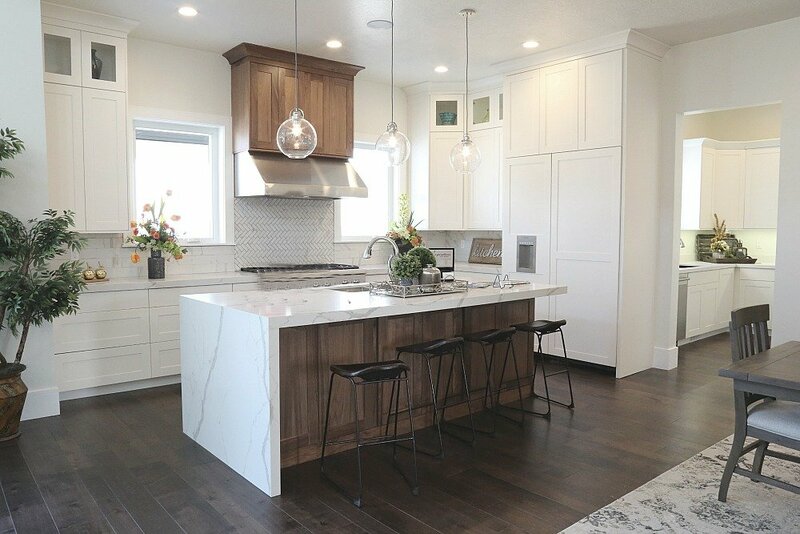 In this home below from Silverhawk Homes that I saw during the Salt Lake Parade of Homes, all the cabinetry was painted white and accents and open shelving was light stained wood. 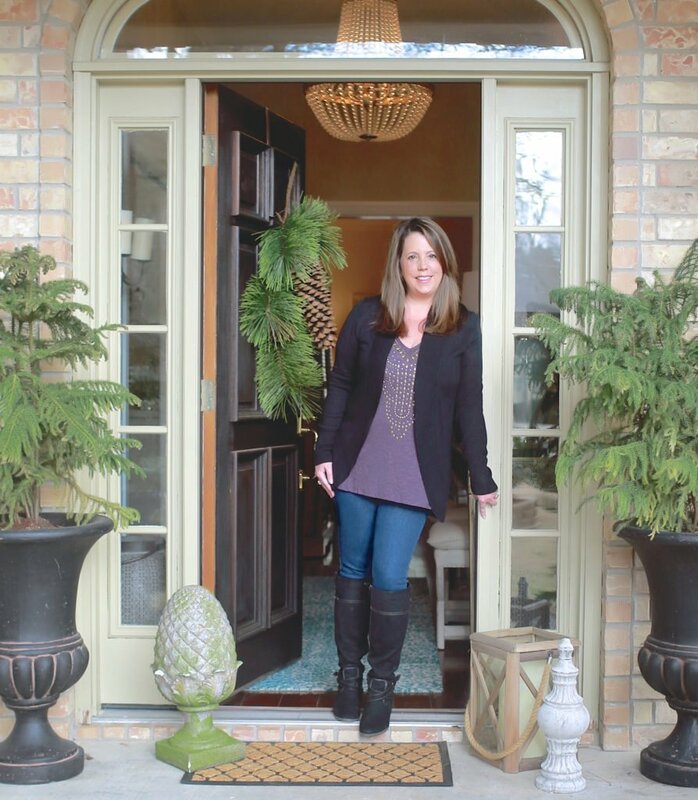 In the Magelby Construction home, I fell in love with the mix of painted and stained kitchen cabinets. 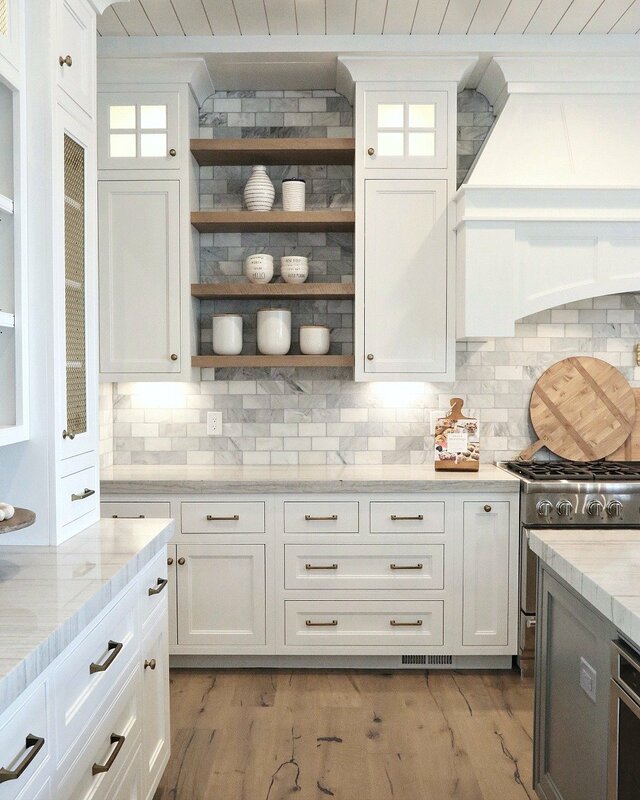 I love this look and I think we will be seeing a lot more of the this trend and mix of painted cabinetry and stained wood. 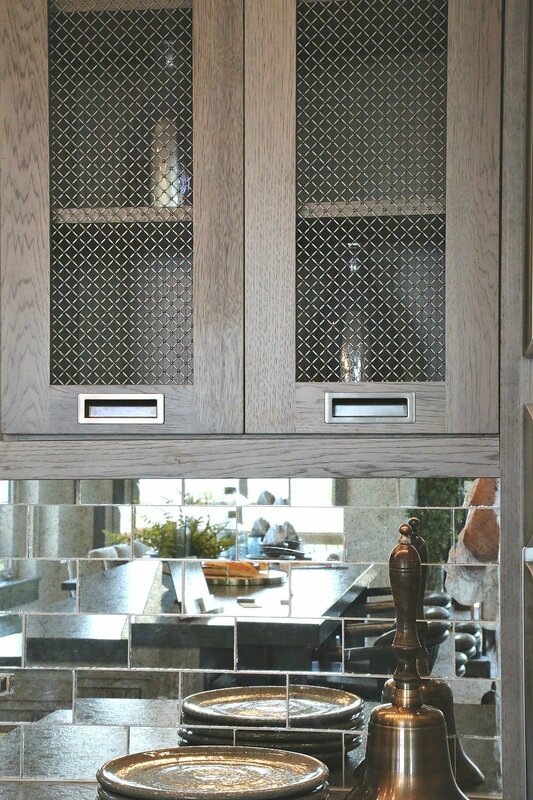 Dark almost black/ebony cabinets is a beautiful shade and another trend that I have also been seeing in new homes. 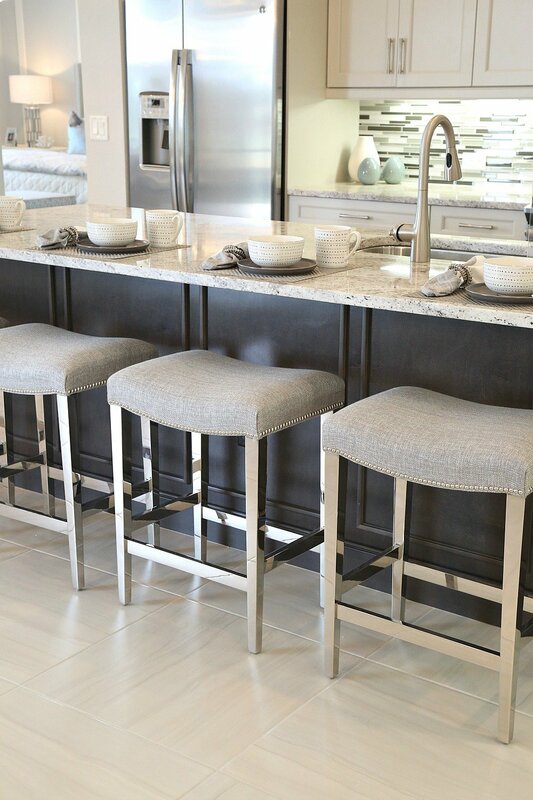 In this home below, the island was a dark stain and kitchen cabinets were painted a cream color. If you want to tone down your cabinets because they are too red or warm, look for ash colored stains or even test the gray colors. 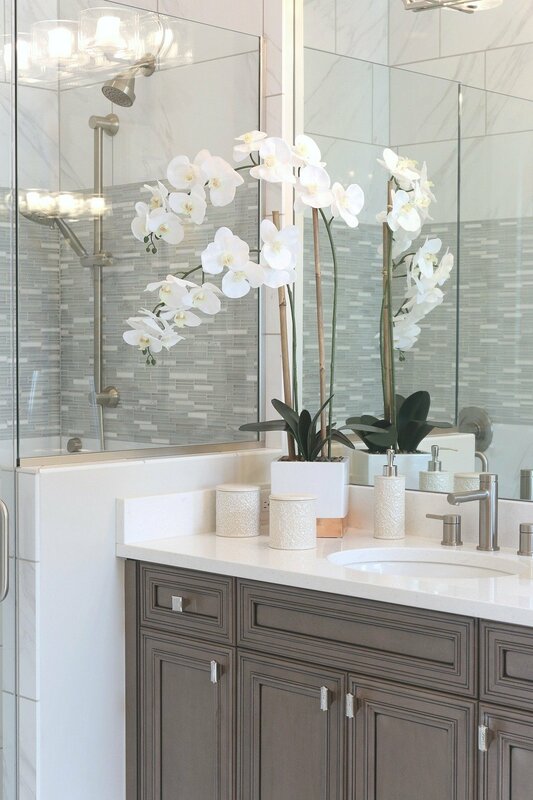 Gray wood tones with a very slight hint of warmth are stunning. If you want to add additional definition to your cabinets, a trick is to glaze corners and lines in an almost black stain and wipe off excess stain. It’s so important to test the stain color first on a hidden spot on your cabinets just to be sure that the color is exactly what you’re looking for. The most important part of staining cabinets is the prep work and I cannot stress that enough! Don’t freak out, it’s not a lot of prep work but there are some things you need to do to prepare cabinetry for re-staining. #1 Remove all of the hardware and remove doors from the hinges. It’s a little extra work but trying to stain cabinetry on the hinges is a recipe for disaster. It works best if you can evenly apply the stain and wipe on flat surface. You’ll want to wear plastic gloves for this part and keep in mind, this is just a light sanding with the alcohol just to clean and remove grime. You do not want to sand down to expose the wood. Just a light and easy sanding with the alcohol to prepare the surface. After you’ve cleaned the cabinets, you will want to dry them with a lint-free cloth and allow the surface to air dry at a minimum of 30 minutes. The stain will not work if the cabinets have any moisture on them. 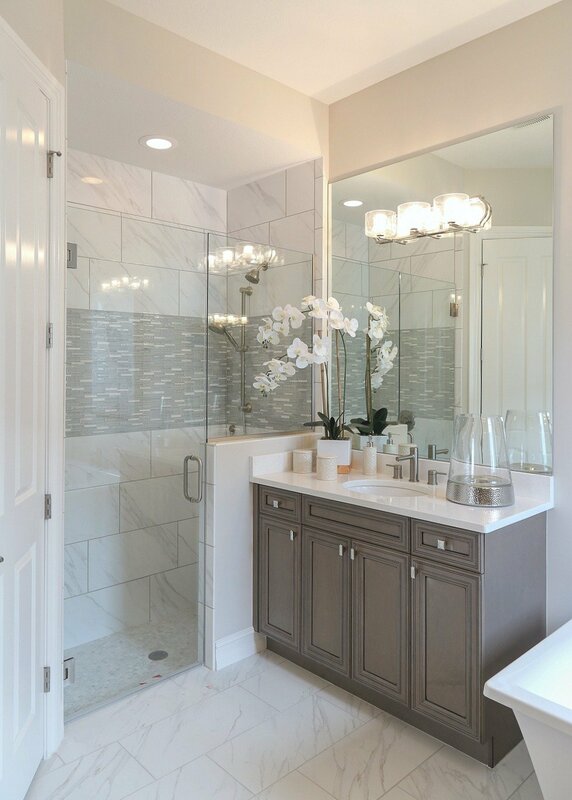 I use lint-free towels designed for cleaning glass like this below for all of my projects. While every stain product has different application instructions, for this post and tutorial, I am giving instructions on using an oil-based gel stain like the Java Gel Stain from General Finishes that I use. 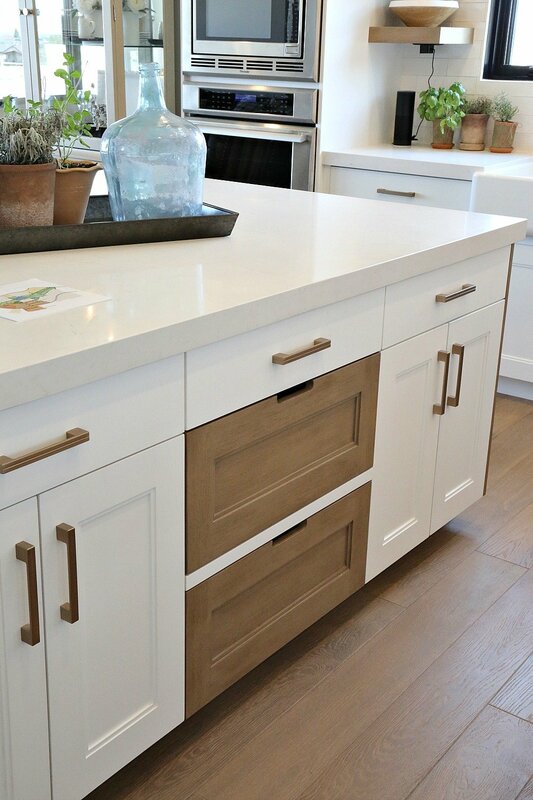 While there are water-based stains on the market, I prefer to use oil-based for cabinets because they are generally high-traffic pieces that get a lot of wear. Oil-based is the most durable finish to hold up to the highest of traffic. If you are using anything other than an oil-based gel stain, you’ll want to read the product instructions. As you prepare to begin, make sure that you stir the stain thoroughly. Often times the color will settle at the bottom on the can. Use a paint stir stick to gently stir and mix. The only technique that I like to use when it comes to staining is that I brush on the gel stain and then I remove the stain with a lint-free cloth or a paper towel versus just painting on the stain and allowing to dry. I do the wipe off technique in 2-3 layers with drying time in between because I personally think the finish looks better this way and I have more control. 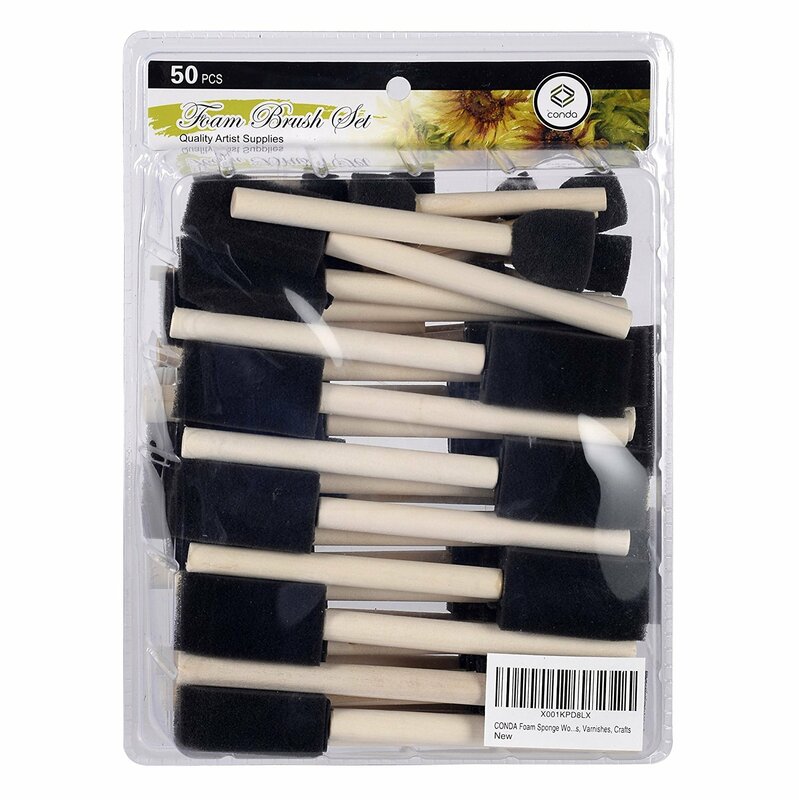 If you are doing this technique, it really doesn’t matter what type of brush you use and even a foam brush would work because you’re simply getting a good layer of stain on then removing. If you prefer just to paint on the stain and allow to dry, I would recommend using a brush specifically for oil-based stains. As you begin to apply the stain, you’ll want to generously cover the area. In other words, you’ll want just enough stain to cover the area you’re working but you don’t want too much to the point that it’s running or dripping. Just a thin layer that covers. Gel stains can dry fairly quickly so after a few minutes, you will want to begin wiping off your stain fairly quickly. If you’re working on doors, probably about the time you have added the stain fully to the door, you’ll want to go ahead and begin wiping off. If you’re working on cabinet bases or an kitchen island, give yourself about 5 minutes to apply the stain and then go back and begin wiping off. 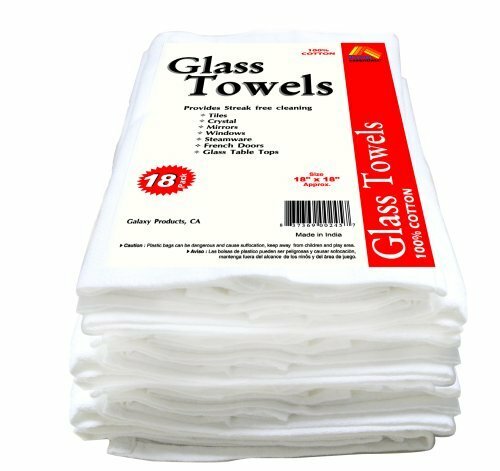 Again, I use the lint-free glass cleaning cloths to wipe the stain off but you can also use paper towels.While paper towels are ok in a pinch, these cloths are gentler and help to give a smoother finish from my experience. You will want to wipe in the same direction as the grain and you will want to use medium pressure. You don’t want to wipe too hard that you wipe all the stain off but you do want to get the excess off. It’s very importantly that you allow enough drying time in between your layers of stain. General Finishes recommends a full 24 hours and I agree. Anything less could run the risk of a gummy finish. Also, I always dry cabinets/doors inside to make ensure that the temperature is just right. Unless you are certain that the temperature in your garage is going to stay above 70 degrees with 50%-70% humidity, than you can dry in the garage. If you’re making a very slight color change, you can probably get away with two layers of stain with drying in between. If you’re making a significant color change, you should be good with three layers. Unlike oil-based enamel type paints where you do not need a top coat, you will absolutely need a top coat when using a gel stain. If you are using an oil-based stain, you’ll want an oil-based top coat. I also recommend that you stick with the top coat of the brand of stain that you are using. It’s much safer this way because products are designed to be work well when used together. I have often heard from readers that they switched brands on the top coats and had problems. You’ve worked hard on your stain and I would highly recommend playing it safe and sticking with the same brand. Be sure sure and stir your top coat thoroughly with a paint stick. Really, really important! I use a foam brush to evenly and smoothly apply a top coat. Again, you’ll want just enough product to cover but not to the point of running. General Finishes recommends 12-24 hours of drying time in between layers for the top coat. I usually stick to the lower end and have not had any issues. 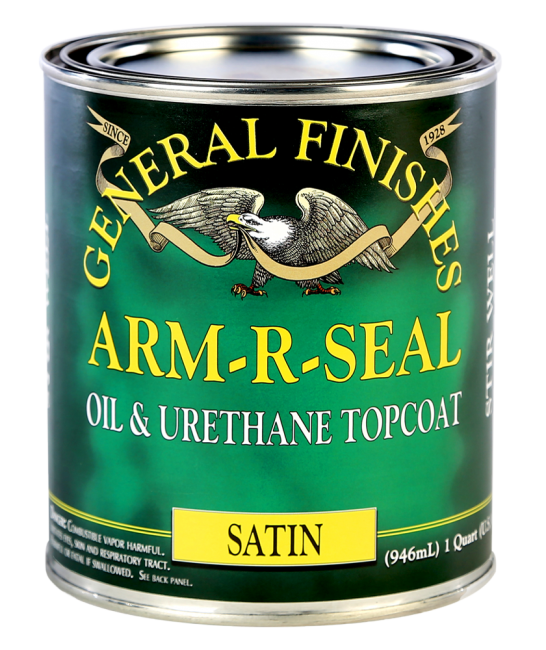 Also, General Finishes recommends three coats but I only do two and have never had any issues as well. 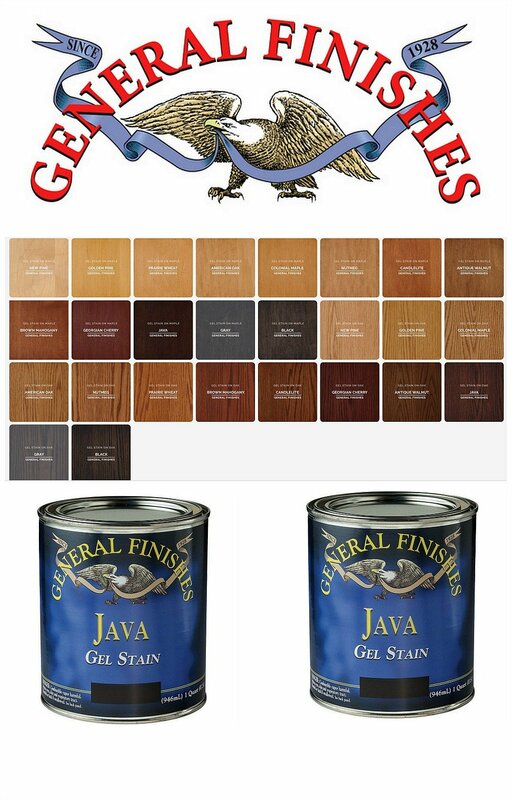 If you are using the General Finishes Java Gel Stain and Top Coat, the General Finishes website has fantastic instructions to walk you through each step that I may have missed here. All you do is scroll down below the product here and you will see the instructions. Also, you can get General Finishes stain at Rockler if you have one near you or online and they have a REALLY fantastic video online showing you in detail how to apply the stain here (it’s kind of hidden but just scroll down and look right below the product image and you’ll see video). I think I covered everything that I can think of. Next week I will be talking more about trends that I have been seeing in new homes the last year when it comes to stains. If you’re need more inspiration, that post will be loaded with great colors and ideas to help you. I will also link it here when it goes up. Have used General Finished on a kitchen table and it has held up well. Have you ever used it on indoor teak furniture? Great information! Do you need to sand between layers of the topcoat? This seems simpler than having to strip the existing stained finish. However, how does the gel stain penetrate if the old surface of the existing stain / finish isn’t actually removed (simply cleaned and scuffed)? Is it that the gel stain sort of sits on top of the existing finish? Thank you! Do you think I can Gel Stain cherry stained cabinets a lighter color, like gray? If the stain sits on top as stated above, seems like it would work? I am not in love with my stock cherry cabinets and have been considering white paint but this seems soooo much easier! I’m all for easy. Yep! I think you could at least go one shade lighter Denise if you used the gray, maybe close to two shades lighter with a good three layers?. I would sample/test the backside of one of the cabinets to see if you’re happy with the results. Keep me posted if you decide to do it! Great info, Cyndy, thanks so much for sharing. we recently had new laminate floors put in our house. The trim used around the bottom of the cabinets and thru out the rest of the house is also some kind of laminate. What do you do with the trim under the cabinets when you paint or stain them? I don’t think that the trim will hold paint or stain. I hate to say this but you would match the trim to the stain color. However, you may be able to get away with painting the trim white if the door trim/molding throughout the space is white. I had it that way in my living room with my media cabinets when I had stained cabinets and I thought it worked. Good luck! Will this gel stain work on painted cabinets or any painted surfaces? Our drawer fronts and doors are stained light and the rest of the actual cabinets are painted an awful peach color! I actually think it will but I think on the painted part, you will need to do a little more sanding. I would email General Finishes and ask them what you need to do to prep the painted part for stain. I’m thinking for sure you would need to use a deglosser. I also think you would need at least 3 layers but I do think it would work. I would LOVE for you to let me know how it worked and any additional steps General Finishes recommended. I have always used Minwax. How does it compare to General Finishes? I plan to refinish my oak cabinets from a golden pecan to a darker stain. Don’t I have to strip off the lacquer finish first then sand, stain and farnish. I read somewhere that you can apply get stain on top of cabinets that are painted. I want to do just the top of a stand alone older cabinet that has a wood too that has been painter white. Is this possible. I can no longer find the link about it. You can Betty but I’m not exactly sure what product would be the best to use. What you are talking about is using the stain like a glaze. 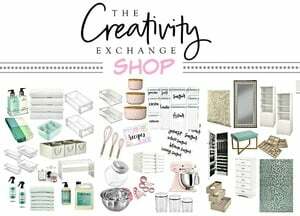 I know for sure you can do it with milk paint with General Finishes and I did a post on using General Finishes here: https://www.thecreativityexchange.com/2015/10/general-finishes-milk-paint-what-and-how.html However, what you would do is use the milk paint as a glaze on a dry brush and swipe on in layers. I know that people have done it with traditional gel stains from Min-wax as well but I’m not sure of the technique and top coat. I would think you would need to do some very light sanding on the paint just to take the edge off and make it more accepting of the glaze. I hope this helps. Thanks! 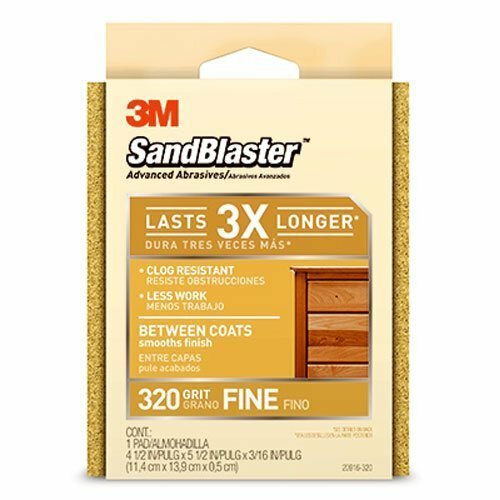 Could you use this technique on baseboards? Or old hardwood dressers? Or is it best to do it the hard way? I was planning to paint my cabinets white because I didn’t know about gel stain and thought painting was my only option to change the finish. Anyway, I have already painted with one coat of primer, can I still use the gel stain over the primer or will I need to strip the primer? 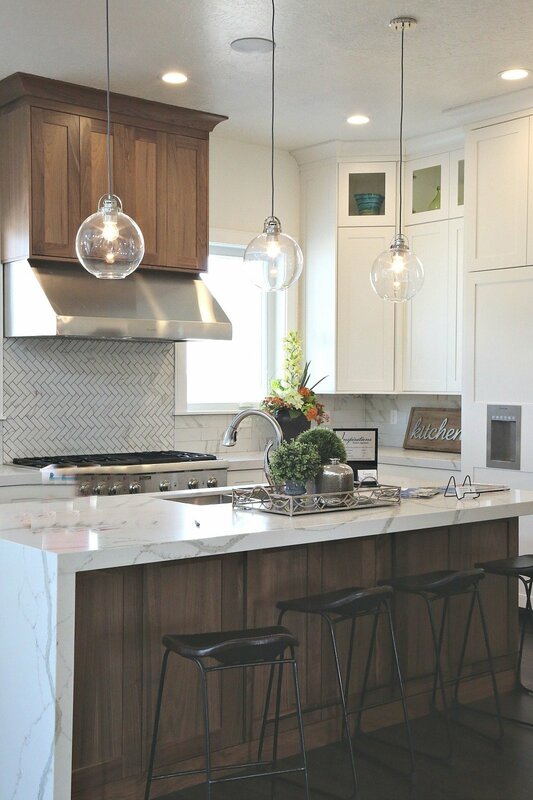 What is the finish color used in the first kitchen picture on this post? I have white washed oak cabinetry in my kitchen and entertainment area ala 1990 and I desperately need to update the color. I followed your post to a T and the cabinets look great except that the gray stain looks very blue. Is there anything can do to bring out more of a gray tone? I have not applied the clear coat yet. I appreciate any help. Thanks! Thanks very much for this information! A question regarding prep: My stained cabinets are old and nicked in heavy use areas (especially around door handles), and in some places the wood is exposed as a result. I’d hoped to repair and and/or sand them down before staining but am concerned about even application of the color. Is there something I can do to prepare exposed or filled wood for staining? There are wood fillers that are specifically designed for staining that will not give an uneven finish unlike traditional wood fillers. I would for sure look at those at Lowe’s and fill in where you can. Talk with the folks at Lowe’s and ask them to show you which ones work best for staining. I hope that helps. My question has to do with the counter tops on the island in the 3rd photo. What is the name of the bluish counter? I love the flowing design! Im assuming it’s granite.